For many, rebounders – the tiny, taut trampolines found in some gyms – are not a part of their fitness routine. Their benefits aren’t as immediately apparent as those of cardio machines and weights, but make no mistake, rebounders have their virtues. The easiest way to utilize a rebounder is to simply stand and bounce without leaving the trampoline’s surface. This can be done before a full workout or simply during idle time like while watching TV. This extremely low-impact exercise helps flush the lymphatic system – the waste disposal network in our bodies. For a more intense workout, rebounders can be used to build strength. First, clear the area around the rebounder then stand in the middle and repeatedly jump as high as possible. Doing this builds strength in the legs as well as the stabilizing core muscles. It also provides the same benefits to the lymphatic system as the light warm-up bounces. Rebounders offer exercisers the ability to get in aggressive cardio without putting undue strain on the knees, back, and ankles. 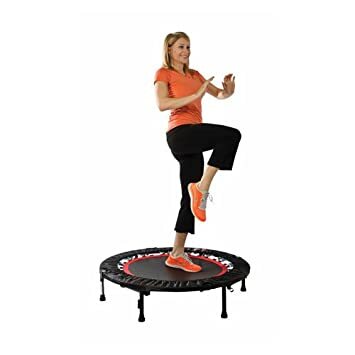 Unlike traditional running, jogging, jumping jacks, etc., rebounders absorb much of the repeated shocks from landing. This allows for lots of aerobic exercise with reduced risk for overworking those areas. And there you have it – immune system benefits, strength, and cardio from one small piece of low-impact equipment. Additionally, rebounders are great for older populations. Some come bars that be attached to the side to stabilize the participant. Elderly exercisers can grab hold of these and do the light warm-up bounces to get a workout and help with balance. After a more rigorous rebounder exercise, consider returning to the light warm-up bounces as a way to cool-down.